Dragons' Cory Hill drives over for a try at the Brewery Field. 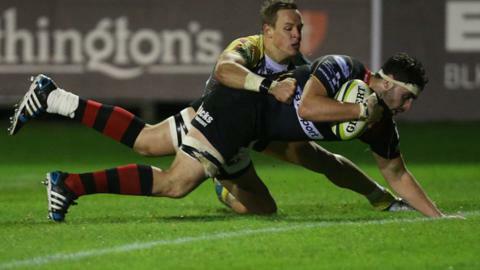 The Dragons ran in six tries and Rhys Jones kicked 21 points in a 51-35 bonus-point victory in the LV= Cup. Ospreys trailed 48-0, but earned a point with five second-half tries at the Brewery Field. Lewis Evans and Cory Hill each scored two tries and Ross Wardle and Jonathan Evans also crossed for the Dragons. Aisea Natoga, Dafydd Howells, Hanno Dirksen and Cai Griffiths scored tries for Ospreys, with Sam Davies converting all four, and a penalty try.